Not to be confused with Chomp Ruins. 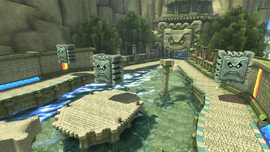 Thwomp Ruins is the fourth and final race track in the Mushroom Cup of Mario Kart 8 and Mario Kart 8 Deluxe. This course takes place in ancient ruins that are populated with Thwomps. The race starts outside, and after a straightaway, turns left twice. Next, there is a right turn that leads the player into a tunnel. Inside, players can either drive up the wall on an anti-gravity path, or stay on the main path which curves right, where Millstones begin rolling out of a raised area. When the player exits the tunnel, they enter an open area with three routes. If the player takes the right or left turn, they can either stay on the main path where there is a Thwomp, or drive up the wall. If they drive straight, they can either drive in to the water and go right or left, or go drive up a ramp to a gliding pad. In the underwater section of the course, engravings in the surrounding walls resemble Thwomp mouths. The gliding pad is only accessible when a Millstone knocks the ramp into place on the second lap. Once the paths join up, players will enter the mouth of a Thwomp, which is also the entrance to another tunnel, and an anti-gravity section begins. There is then a right turn, which leads to the tunnel exit. After this, there are three more turns, and two Thwomps, leading to where there is a gliding section and a straightaway toward the finish line. If one uses a speed boosting item in the grass between two big rocks, one can cut off the first two turns. One can drive onto a wooden board cutting off the turn before the second gliding section. The staff ghost for this track is Donkey Kong on the Varmint, with a time of 2:11.157. In Mario Kart 8 Deluxe 200cc, it is Bowser with a time of 1:31.436. Iggy and Bowser race inside one of the track's tunnels. In the E3 trailer, the anti-gravity section was a normal section and the finish line wasn't present on the path after it. This page was last edited on October 6, 2018, at 18:51.